Which are the most livable cities in Mexico? In an attempt to find out, each year the consultancy Gabinete de Comunicación Estratégica (GCE) publishes its National Quality of Life Index. For the 2015 version of this index, GCE polled more than 30,000 people in 55 cities about their housing, education, transport, cleanliness, recreational opportunities, security, natural beauty and local attractions. Which city came top? The top-ranking city was Mérida, which scored 83.3 out of a possible 100 points, followed by Saltillo (79.6), and Aguascalientes and Mazatlán (tied at 78.8). Which cities came bottom? 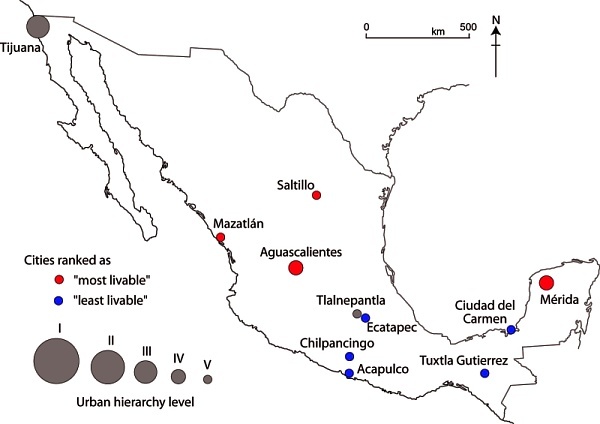 The five cities rated least desirable were Tuxtla Gutiérrez, Ecatepec, Acapulco, Ciudad del Carmen and Chilpancingo. Which cities rose most in the rankings? The cities which rose most in the rankings from last year were Saltillo, which rose five places; Tijuana, which jumped 21 places to #25, and Tlalnepantla, which improved 13 places to #36. The methodology is at least somewhat suspect if Nuevo Laredo consistently ranks above Queretaro, while Guanajuato and Zacatecas and Morelia don’t show up anywhere near the top, nor does Playa del Carmen. Nuevo Laredo is a pit, with daily Zeta attacks and shakedowns. Ugly as sin, no architecture, no culture, nothing to attract visitors except a pair of bridges, that many people will drive 40 miles to the Colombia Friendship Bridge to avoid. It would be as though Newark of Stockton or Lubbock or Buffalo were outpointing Boston and San Francisco. Makes no sense. These data are all based on self reporting and my experience, in Mexico, is that self reported data is never reliable. Mexicans seem to have individual and very fluid motivations for “Gaming” surveys. Nevertheless self reporting is a cheap easy way of coming up with “something”. I’m interested to see how “El Bronco” fares with his use of Facebook as a measure of what needs to be done by who in Nuevo Leon.His facebook democracy. is being gamed into fantasy.